We love working with our local community when we can. Our local health food store, The Elephant Cloud, requested Blue Stain Pine shelving units. We custom built these to fit under their counter to maximize unused space. Adding our slight curving flare gives it a perfect touch to catch the customer's eye. Thanks Michelle and Sunia for going local once again! We feel the magic! Our New Displays for our clients at Coventry Creations Candles. Reclaimed Beetle Kill Wood with Laser Engraving. Really Cool . . . and Hot! We have been waiting to share these with you all summer. Introducing our new ‪Beetle Kill Pine product displays for our clients Sounds True! Pictured Below: Custom Logo Signage, CD Spinner, Book Spinner, CD rack and Trade Show presentation. Check out what we created with our kids for The Crestone Music Festival in August. Blue Earth Design is a Family Affair! Thanks for taking a look. What can we say?! We LOVE the raw and heartbreaking beauty of this wood. Beetle Kill Pine from forests of the west. These trees were taken over by beetles and died, leaving acres upon acres of dead forests behind. The fungus carried through the wood by the beetles leaves this awesomely irregular blue stain, making the finished look one of a kind. By utilizing these downed trees, we are helping clear the forest of a huge wildfire threat while bringing attention to Climate Change. Our daily reminder of our connection to the Earth and our responsibility. Tell a friend and thanks for taking a look! Blue Earth Design is honored to assist the Crestone End of Life Project. One of the only non denominational open air cremation sites in the U.S., CEOLP helps people connect in a simple and profound way to the sacred passage of death. Making each stretcher is a meditation for us and a deep way to give our respects to our passing community members. Thank you thank you thank you. For more info, connect with The Crestone End of Life Project. What do you do when a customer doesn't know what finished look they want? You give it to them! 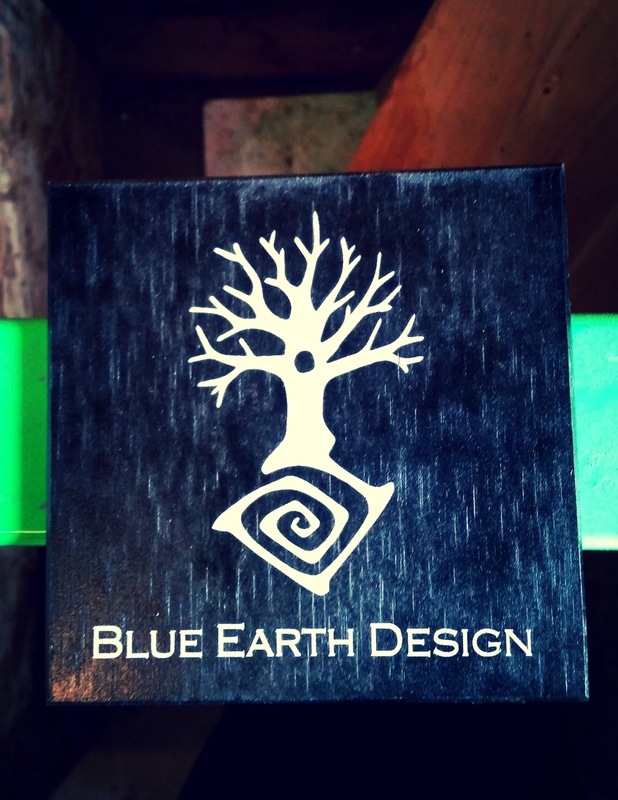 From mahogany, beetle kill, wooden obsidian, to naturally clear, these are the looks we can provide here at Blue Earth. Plus, they make awesome business cards! Or coasters or tiles or...fun pictures :) Thanks for looking! Recently, Nick Chambers of Valley Roots connected with us on his local food tasting tour. He needed a display to show all the goodies that are grown and produced in the San Luis Valley of Colorado. So, we hooked him up! The first of more to come, this display includes a laser engraving of his Valley Roots Logo. Thanks to San Luis Valley Local Foods Coalition for spearheading this project! Let us know if you would like one of these in your hotel, shop, or store...keeping it local and knowing where your food comes from is such a lovely thing. Local jerky, wha?!?! Yum. From original art work to an end table for his mother, Avery created some amazing pieces this year. But his final project with Adam really produced the goods. Weeks in the making with curiosity and endurance, the guitar is here! Bonus: it makes sound!!!! Beautiful sounds at that! The holes find their homes! Snow Lotus aromatherapy product displays complete and ready to go out into the world. Beauty. Holey holes, peeps. Getting an order together. Thanks again to our valued customers. This one is for Snow Lotus Aromatherapy... Check them out.